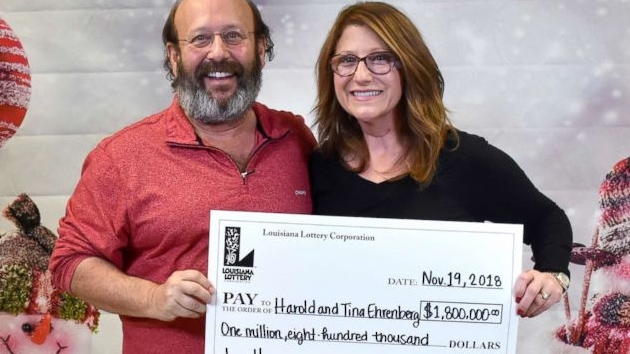 Harold and Tina Ehrenberg found the $1.8 million jackpot-winning Louisiana Lottery lotto ticket on their nightstand on Saturday, Nov. 17, two weeks before their right to claim their winnings expired. The drawing for the ticket was on June 6. (NEW YORK) — A Lousiana couple preparing to welcome their family for Thanksgiving were cleaning their home this week when they found an unexpected surprise: a winning lottery ticket worth nearly $2 million. “It was pretty exciting,” he added. Harold Ehrenberg said that he and his wife wanted to go to the lottery office right away to make sure they weren’t making a mistake, but it was a Saturday and the office was closed. Tina Ehrenberg said that she “called the winning numbers hotline over and over,” a statement from Louisiana Lottery said. Harold Ehrenberg said that he realized the urgency with which he had to claim the prize after counting down the days from the drawing, and realizing they had two weeks left to claim the prize. Prizes for draw-style games must be claimed within 180 days of the drawing in which the prize was won, the statement said. “I kept waiting for something to go wrong,” Harold Ehrenberg said. The couple received $1,274,313 after state and federal taxes were taken while the vendor of the winning ticket received 1 percent of the total prize: $17,948. The couple said they are going to hold the money until they retire. “We don’t have any plans to buy anything crazy or go on any big trips,” Tina Ehrenberg said. “The most fun is going to be depositing that check!” Harold said.